The Washington Times has always been conservative and error-prone. Now, it's helping to popularize extremist ideas and neo-Confederate sympathy. When President George W. Bush nominated John Ashcroft for attorney general, it didn't take long for the press to unearth Ashcroft's 1999 interview in Southern Partisan magazine. Ashcroft had praised the neo-Confederate publication for "defending Southern patriots" such as Robert E. Lee, Jefferson Davis and Stonewall Jackson, and he'd pledged to follow the magazine's example. "I've got to do more," Ashcroft said. "We've all got to stand up and speak in this respect, or else we'll be taught that these people were giving their lives, subscribing their sacred fortunes and their honor to some perverted agenda." Most media outlets depicted the flap over Ashcroft's pro-Dixie sentiments as a side issue, just one more reason why his nomination was controversial. But the nation's "conservative paper of record," The Washington Times, saw something different. On Jan. 16, 2001, the day Ashcroft began facing his critics in Congress, the Times devoted a chunk of its front page to an unusually long story with a provocative headline: "How the Democrats made loving Dixie a hate crime." For a paper with a loyal readership on Capitol Hill, the story, written by Assistant National Editor Robert Stacy McCain, was nicely timed for maximum impact. But despite the headline, it did not detail a Democratic effort to outlaw Dixie-loving. Instead, it described a growing resistance to Confederate displays and symbols as seen through the eyes of six experts, five of them arch-conservatives with well-established neo-Confederate sympathies. An NAACP representative was also quoted, deep in McCain's story, but his comments were immediately rebutted by Charles Lunsford (see Hate and Heritage), the neo-Confederate activist who coined the phrase, "heritage, not hate," and by leftist-turned-rightist David Horowitz (see Center for the Study of Popular Culture), who called the NAACP "a defamation and shakedown organization." Casual readers of The Washington Times might well have been puzzled. Why would a major daily newspaper — one that bills itself as "America's Newspaper," no less — turn the Ashcroft controversy into a battle over loving Dixie? And why would it showcase a story so heavily slanted toward neo-Confederate opinions on race and heritage? For devoted readers of the Times — a group that includes many of the nation's leading conservative politicians, journalists and think-tankers — McCain's story was old hat. These readers know the Times loves to stir controversy with headlines and stories so provocative that other media outlets can't resist repeating them. They know the Times is the only major American newspaper that still features a weekly Civil War page. They know the Times has become a reliable source for extremist views on race, religion, immigration and Dixie. Founded in 1982 by the Rev. Sun Myong Moon, the right-wing cult leader from South Korea, The Washington Times quickly made a name for itself with an approach to news reporting that was unusually ideological. While mainstream media critics scoffed at "The Moonie Times" for enthusiastically championing the Rev. Moon's staunch anti-communism and his efforts to move the Republican Party farther right, the Times made a splash in conservative circles. President Ronald Reagan said it was his favorite paper. Right away, the Times showed a knack for taking its message to the mainstream, advertising itself as the "third most quoted paper" in the U.S. by its third year. The Times' quotability and importance to conservative leaders quickly gave it a stature that outstripped its relatively small circulation. While the crosstown rival Washington Post moves more than 800,000 papers each weekday, the Times' circulation has never climbed much higher than 100,000. By his own estimate, Moon has spent upwards of $2 billion to keep the unprofitable paper afloat. While the Times made itself must reading for right-wingers, it was also developing a reputation for shoddy journalism. From the start, the Times' front page was studded with scandalous stories bearing catchy headlines and sensational openings that more closely echoed the style of European tabloids than that of large American newspapers. Whether they were taking aim at Democratic politicians like Barney Frank and Bill Clinton, assailing out-of-step conservatives like Sen. John McCain, or slamming "liberal" organizations like the National Education Association and the NAACP, these eye-popping stories often rippled through the rest of the scandal-hungry media — even though some of them were later proven to be slanted, deceptive, or downright false. "The Washington Times is like no major city daily in America in the way that it wears its political heart on its sleeve," said the nation's leading journalistic watchdog, the Columbia Journalism Review (CJR), in 1995. "No major paper in America would dare be so partisan." The folks who call the shots at the Times insist that their news is no more infected with ideology — or riddled with error — than anybody else's. The Intelligence Report made repeated attempts to talk with Washington Times Editor in Chief Wesley Pruden, Managing Editor Francis Coombs and National Editor Ken Hanner about the allegations and criticisms in this story. These requests were either ignored or, in Coombs' case, declined. But Pruden has given his side of the story to Southern Partisan and CJR. "I don't ever want the Times to be known as a newspaper that writes the news from a conservative point of view," he told Southern Partisan. Where the conservatism creeps in, he told CJR, is in which stories the paper chooses to designate as news. The Times, Pruden said, is different simply because it reports "stories other papers are loath to cover." One such story appeared in early July, when "Inside the Beltway" writer John McCaslin endorsed the so-called "NORFED Liberty Dollar" in his column. This "alternative currency" has been marketed aggressively to antigovernment "Patriots" as a challenge to the Federal Reserve, which is seen as responsible for a host of financial ills. McCaslin uncritically repeated NORFED founder Bernard von Nothaus' claim that widespread use of the Liberty Dollar could eliminate the national debt "completely." The currency is supposedly fully backed by silver, but in fact is sold for almost twice the market value of the silver that it can be reimbursed for. Even more stunning, the expert source McCaslin cites on Liberty Dollars — calling him "a Web development consultant for political and corporate clients" — is Bill White, a notorious anti-Semite who runs the neo-Nazi web site Overthrow.com. "I spend them everywhere," White gushes. In fact, they can be used almost nowhere. A few days later, The Washington Times' knack for floating stories into the mainstream — no matter how outrageous — was demonstrated once again. ABC Radio stalwart Paul Harvey, in his unmistakable boom of a voice, aired a glowing story about the Liberty Dollars. Under Dixie-loving editor Wesley Pruden, the Times regularly reports on a war that ended 138 years ago. Pruden was elevated from managing editor to top dog of the Times in 1992. It was pivotal time for the paper. With the Cold War won and conservative politics in the ascendant, the paper needed a fresh sense of mission. When he sat down for a long interview with Southern Partisan not long after his promotion, Pruden left little doubt about where he would lead the paper. After singling out the Southern culture warrior, Sen. Jesse Helms, as a political hero, Pruden bragged about his great-grandmother shooting a Union cavalryman and boasted that the Times was the most "in-your-face" conservative newspaper in America. When Robert E. Lee's birthday rolls around every year, he said, "I make sure we have a story" — especially because the occasion "falls around Martin Luther King's birthday." Pruden started with the Times shortly after its founding. He was originally hired on a probationary basis, founding editor and publisher James Whelan told the Washington Business Journal, because Pruden had run into ethical problems as a reporter. Born and raised in Arkansas, Pruden has a deep-rooted affection for Dixie. His father, the Rev. 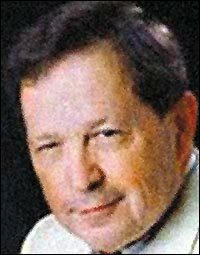 Wesley Pruden Sr., was a leading spokesperson for Little Rock's racist Capital Citizens Council, which fought bitterly against school desegregation in the 1950s and 1960s. During the landmark confrontations at Little Rock High School in 1957, when President Dwight Eisenhower sent National Guard troops to protect nine black teenagers as they entered the white school, Pruden Sr. reportedly told the assembled mob: "That's what we've got to fight! Niggers, Communists, and cops!" According to an investigation by Salon.com, Johnson's Washington Times stories were part of the anti-Clinton Arkansas Project, which mounted a well-financed campaign to discredit Henry Woods, the federal judge originally appointed to preside over criminal proceedings in the Whitewater case. The doubts about Judge Woods raised in Johnson's op-ed pieces percolated through the media for months, and Woods was eventually replaced by a judge more friendly to Whitewater investigators. Pruden's contribution to the anti-Clinton efforts didn't stop there. Even as he oversaw his paper's wall-to-wall coverage of Whitewater and the Monica Lewinsky scandal, the editor was creating a stir with his own op-ed columns about Clinton — including one that broke the "news" about Bill, Monica and the cigar. Pruden is also legendary, as an editor, for manipulating headlines and stories to ratchet up their political slant — so much so that Washington Times staffers coined a verb, "Prudenizing," to describe the tampering that has led some of them to resign in protest. 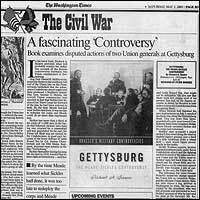 In 1998, Pruden, whose newspaper is the only major daily in America that runs a weekly page about a war that ended 138 years ago, spoke to the United Daughters of the Confederacy at the Manassas Battlefield Park. He began by making the kind of promise most editors avoid at any cost: "I will never fail to respond to you when you call on me for help, because I believe in what you are doing to cherish and protect and preserve the heritage of our great Southern people." Concluding with a flourish, Pruden said "Southerners ... hold loyalty to two countries in our hearts." The second country is one "baptized 137 years ago on this very field in the blood of First Manassas, a country no longer at the mercy of the vicissitudes in the tangled affairs of men, a country that lives within us, a country that will endure for as long as men and women know love. ... God bless America, God bless the Confederate States of America, and God bless you all." Though he declined to talk with the Intelligence Report for this story, Pruden has denied that his personal beliefs color The Washington Times. "We are editorial page conservative," Pruden told Southern Partisan. "But we like to think that on news we just lay it down the middle and let people make up their own minds." In 1995, Pruden appeared to strike a blow for "down the middle" fairness by firing The Times' other voice of the extreme right, syndicated columnist Samuel Francis. A new book by neoconservative stalwart Dinesh D'Souza had quoted Francis' speech at a 1994 conference on "Race and American Culture" sponsored by American Renaissance, a white supremacist journal that promotes eugenics and believes, among other things, that whites are inherently smarter and less violent than blacks. After D'Souza portrayed Francis as a purveyor of the "new spirit of white bigotry," Pruden told him the Times would no longer run his column. In 1994, Francis had been demoted to a half-time staff position after he wrote a column lambasting the Southern Baptist Convention for officially "repenting" for its support for Southern slavery — even though Pruden had expressed a similar view in a column of his own, published in Southern Partisan. Still, if the reasons for Francis' dismissal were murky, the public symbolism was clear enough: Even on its unabashedly conservative editorial page, the Times did have its limits. But only two years later, the Times reversed course dramatically, hiring a writer whose views on race and Southern heritage are arguably more extreme than either Francis' or Pruden's. And this time, those views would be expressed not in op-ed columns but on the Times' news pages. With the arrival of Assistant National Editor Robert Stacy McCain in 1997, the Times' disassociation from the racism of American Renaissance became a distant memory. McCain, who wrote the story about Democrats and Dixie, has covered the group's biannual conferences in 1998, 2000 and 2002, making the Times the only major American newspaper to devote news stories to American Renaissance. Since 1999, the Times has also reprinted at least six excerpts from American Renaissance in its page-2 culture section, never acknowledging the highly controversial nature of the source. "Activist warns of border war," blared the headline for McCain's latest American Renaissance story on Feb. 25, 2002. McCain was covering an American Renaissance conference on immigration, and his opening paragraph was almost as sensational as the headline: "A border war between the United States and Mexico 'could happen any day,' a California activist warned at a weekend conference in Virginia." All 572 words of the story either paraphrased or quoted this same "activist," Glenn Spencer, who runs the anti-immigration group, Voice of Citizens Together, which the Southern Poverty Law Center and Anti-Defamation League officials have described as a hate group. Without questioning their factuality, McCain's story reported Spencer's assertions that Mexican leaders were conducting an "invasion" of the United States and that "I love Osama bin Laden" T-shirts were all the rage south of the border after 9/11. No opposing viewpoint was offered or even referenced. "Sending a reporter to this conference was like sending a reporter to a Ku Klux Klan rally," a flabbergasted reader wrote to the Times. Though the paper printed his letter, the reader's objections appear unlikely to be heeded. McCain has made no bones about being a fan of American Renaissance, writing a letter of "warm congratulations" to the magazine in 1997. It is extremely rare — in fact, it is typically expressly forbidden — for a journalist to publicly express admiration (or disdain) for a group he writes about. Something else about McCain is even rarer: he belongs to a hate group — the League of the South (LOS) — that shares some of American Renaissance's views on race. The League, a white-supremacist organization that opposes racial intermarriage, has defended historical segregation and even slavery, and advocates a second Southern secession from the U.S. If McCain and his editors followed the usual rules of journalistic ethics, steering him clear of subjects related to his partisan beliefs, his hate-group membership might not be an issue. But the 43-year-old Georgia native, who left the Rome News-Tribune (circulation 17,000) for The Washington Times in 1997, has specialized in subjects that are vital to League of the South members: race, religion, guns, immigration, and controversies over Confederate flags and "heritage." An avid poster on Internet discussion groups, McCain has aired strong personal views on these subjects. In December, New York Press media critic Michelangelo Signiorile published some of McCain's contributions to FreeRepublic.com, written under the pseudonym BurkeCalhounDabney. McCain asserted that the civil rights movement inspired "black criminality" by encouraging people to get arrested at demonstrations. "I am disturbed … by [Jesse] Jackson's idea that 'breaking white folks' rules' was somehow inherently just," McCain wrote. "If rules were to be broken merely because they were the work of white folks, then hasn't Jackson gone a long way toward explaining the explosion of black criminality that began in the 1960s?" Signiorile, who was alerted by a reader to McCain's postings, told the Intelligence Report he was "amazed" by what he found. In one posting, McCain suggested that Harvard University President Lawrence Summers be "persecuted and run out of town" for supporting gay rights. In another, McCain gave his take on interracial relationships: "[T]he media now force interracial images into the public mind and a number of perfectly rational people react to these images with an altogether natural revulsion," McCain wrote. "The white person who does not mind transacting business with a black bank clerk may yet be averse to accepting the clerk as his sister-in-law, and THIS IS NOT RACISM, no matter what Madison Avenue, Hollywood and Washington tell us." Shortly after Signiorile's story appeared, and McCain's extremist views began to circulate around journalistic and political circles, every posting by BurkeCalhounDabney was deleted from FreeRepublic.com. McCain's beliefs often creep into his stories in ways that readers might not notice. In 1998, McCain wrote the Times' obituary for George Wallace, the Alabama governor who became the South's most famous segregationist. Hailing Wallace as "a man who transformed American politics" and paved the way for conservative electoral triumphs, McCain quoted three scholars on Wallace. All the scholars were identified as history professors — but not as leaders in the same hate group McCain belongs to, the League of the South. "[A]s a working journalist with 10 years' experience," McCain once wrote on the League's DixieNet Web site, "I am well aware of how reporters can subtly frame their stories to suggest which side in any controversy is in the right." McCain's stories for the Times often display this expertise, relying on sources from hate groups without acknowledging the controversial nature of their views — and immediately shooting down any opposing viewpoints, like those of the NAACP leader in McCain's story on Dixie-loving as a "hate crime." If McCain's not-so-subtle framing of the news has raised eyebrows around the Times' newsroom, it doesn't appear to have affected the kinds of stories he's assigned to write. In 2000, when African-American writer Lerone Bennett Jr. published a controversial book accusing Abraham Lincoln of being a racist (see related story Lincoln Reconstructed), McCain wrote an approving feature about the book even though — perhaps unbeknownst to his editors — he had already expressed vehement opinions on the subject. In an Internet discussion group, McCain had written that Lincoln was a "war criminal" who should have been tried for "treason." On DixieNet, McCain — using his own name — had even concocted a mock "Wanted" poster for Lincoln, whom he described as the "1st RULER and TYRANT of the AMERICAN EMPIRE" and a perpetrator of "Murder, False Imprisonment, and numerous HEINOUS crimes against the SOUTHern states and AMERICANS in general!" "I cannot believe that they allow him to stay" at the Times, says Signiorile. "I don't think any paper should have anyone in a racist group covering these issues, or covering racial politics. It's completely outrageous to have someone like that covering news at all." McCain and his editors declined several invitations to talk to the Intelligence Report about his League of the South affiliation and its impact on his reporting. But McCain has expressed typically strong views on who should be covering news — especially news about the South. In 1996, a year before he was hired by The Washington Times, McCain co-wrote a manifesto called "Down on Dixie: the Confederate Cause and the South's Scalawag Press." Advertised for $1.50 apiece on DixieNet, the 16-page pamphlet looks nostalgically at "a time, not so many years ago, when newspapers in the South were also expected to be newspapers of the South and newspapers for the South." By contrast, McCain and his co-author, now-deceased Sons of Confederate Veterans member Gilbert Smith, accuse modern-day Southern journalists of waging "a vicious campaign of propaganda and distortion" by saying, among other things, that the Civil War was fought over slavery. "[L]et Southern journalists continue to sneer in ignorance at those things which they imagine are represented by the Confederate battle flag," McCain concludes, in a condensed version of the pamphlet that appeared on DixieNet. "But this I shall not do. I shall not buy into the North's hypocritical claims of moral superiority. Like my ancestors before me, I'll take my stand in Dixie." And as long as he continues to take that stand in The Washington Times, with the powerful backing of his editor in chief, one thing is for sure: Nobody will accuse the Times of succumbing to the Scalawag Press.